Nora Szech is a KIT Expert with a focus on market design, institutions, and moral values. She works theoretically as well as empirically in order to understand market mechanisms and their impact on welfare, revenues, and values. The magazine Capital nominates Nora Szech in the category "Society and Science". More information. In this podcast of the Süddeutsche Zeitung Gerd Gigerenzer, Malcolm Gladwell, Julia Rothhaas, and Nora Szech talk about the relationship of economy and gut feeling. Susanne Klingner is doing the interviews. Marietta Schwarz talks with Nora Szech about current topics from behavioral economics, about morals in economic institutions, and about the roots of game theory. There is also some music, ranging from The Cure to Oasis to Anohni to Taylor Swift. To the podcast. The focus of the OECD Integrity Week in Paris was on fighting corruption worldwide. Multiple public and closed events surrounded the main event of the week, the OECD Integrity Forum. Nora Szech was one of the panelists at the Forum. The OECD provides lots of information on the topic and on the event that takes place on a yearly basis, which you can find here. Max Hägler from Süddeutsche Zeitung interviews Nora Szech on the diffusion of responsibility in economic institutions. To the video. How do people get morally corrupted? This question discusses Nora Szech in an Interview with Thomas Fritz. What do ethically interested customers have in common with the famous German author Martin Walser? The answer can be found in the German daily Süddeutsche Zeitung. Jannis Engel and Nora Szech provide all according details and background in their working paper. "Priority in case of equal qualification"
What kind of effects do we see from the rule "priority in case of equal qualification"? Stronger as well as weaker candidates may become more motivated. Diversity and performance incentives then do not exclude each other, but become rather aligned. Is a little good good enough?! Invited by the Plural Economists, Nora Szech gave a public talk in Mannheim. She focused on the use of cheap excuses in every-day product choice, and how firms potentially draw customers' attention away from ethically relevant product facets. The according research paper with Jannis Engel can be found here. Moderated by Ulrich Kühn, four professors from the fields of theology, economics, business administration, psychology and personality development discuss the role of trust in our society: Friedrich Wilhelm Graf (LMU), Guido Möllering (U Witten-Herdecke), Nora Szech (KIT), and Martin Schweer (U Vechta). Here is a link to the event. "These People will Coin 2017"
Marc Beise is the head of the economics section of the German daily Süddeutsche Zeitung. For 2017, his recommendation is to pay specific attention to our research. To the video. The largest regional newspaper in Austria, "Die kleine Zeitung," features in its book review of 2016 articles about Henri Lévy, Christine Nöstlinger, Hans-Werner Sinn, Nora Szech and others. At the beginning of 2017, the German daily Süddeutsche Zeitung focuses on the decision-making in markets. In her article, Nora Szech describes the influence of market design on moral decision making. Besides institutional design, personal facets, political orientation and gender play important roles. … titels the magazine RATIO, featuring articles by/about Richard David Precht, Bernhard Schlink, Nora Szech, and others. Wolfgang Heim talks with Nora Szech about market and competition design, morals, and consumption behavior. The show is available as a podcast. "Think whatever you want. 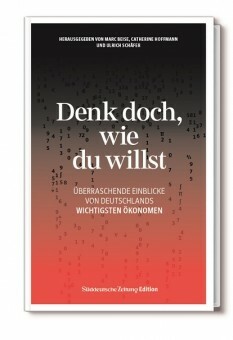 Surprising insights from Germany's most important economists"
This is the title of the new book by the German national daily "Süddeutsche Zeitung". It presents 36 influential German economists under the age of 50, from all varieties of fields within economics. One of these is Nora Szech. Check out the interview about her research, e.g. the desire for excellence, moral implication of markets, and design tools to render competition more sustainable. Most Germans would like to eat in more sustainable ways. The German weekly "Die ZEIT" invited to discuss and try out approached towards this goal. Participants included celebrity chefs Sarah Wiener and Tim Raue, mayor of Berlin Dilek Kolat, farming minister Robert Habeck, ZEIT chief editor Giovanni di Lorenzo, his deputy Moritz Müller-Wirth, and journalists Susanne Schäfer and Martin Spiewak, Patricia Wratil of the Berlin Social Science Center, gastrosoph Harald Lemke, executive of slow food Ursula Hudson, chief editor of the magazine "enorm" Marc Winkelmann and Nora Szech. Tie-breaking has important impacts on motivation and overall efforts of contestants. Science Daily reports about our studies on the topic. The SRF TV show "Kulturplatz" reports on the VW emissions scandal, and business ethics in general. Included you find a report about our research as well. Which colors do we expect to see on a festive plate? Which role plays the meat in an elegant or joyful dinner? How much meat do we expect to see? How much do we want to eat? Do we need the meat at all? And what colors should go with it? The book Meat and Color by Anna Becker, Steffen Huck, Julia Schubert and Nora Szech illustrates in three artsy studies everything that we associate with a savory, jolly, or elegant meal. In an interview with Digital Manufacturing Magazin, Nora Szech discusses mechanisms to increase customer awareness of sustainability. Robert M. Sapolsky, professor of biology, neuroscience and neurosurgery at Stanford University, reflects his column in The Wall Street Journal about markets and their moral implications and discusses our research. Please find his article here. Have a look at the artwork of artist Uli Schaarschmidt - one of his pieces was inspired by our research. Interview with Nicole Walter from "Fluter"
The German journal "Fluter" has devoted a whole issue on the topic of markets and morality, and Nicole Walter has interviewed Nora Szech on the topic. To the Deutsche Welle Interview with Nora Szech. Nora Szech speaks about our research into ways that markets influence moral decisionmaking. Steffen Huck and Nora Szech invited to think about "Animals as Food" with Melanie Joy, Bernd Ladwig and Gerhard Manteuffel as speakers. You can watch the video here. For a detailed interview with Bernd Ladwig see here.